Samsung may be all set to bring out the next version of its S line of devices. If reports are to be believed than the Korean electronics giant is about to bring a completely redesigned device. 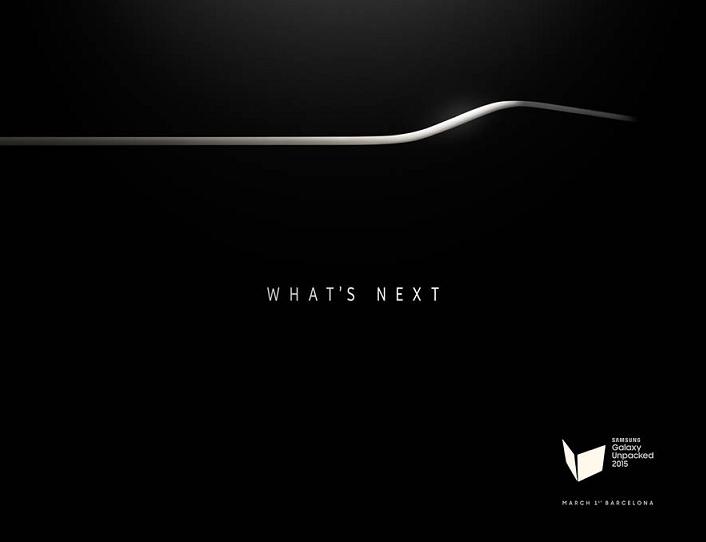 The invite sent out by the company for the unpacked event simply shows a curved edge of a device with the title “What’s Next.” The device is widely expected to be the upcoming S6 and is said to come with a curved display. The Galaxy S6 is expected to flaunt an Ultra HD 4k display with 4GB RAM and a 20MP camera. The device is expected to be powered by a 64-bit Exynos 7420 and Broadcom’s new sensor chip. Samsung was previously working with the Snapdragon 810 processor but faced overheating issues. The company will now deploy Exynos 7 with LTE while Qualcomm has said that it will be reworking the Snapdragon 810 chipset for Samsung’s flagship devices. A leaked render from a journalist named Antonio Monaco shows a device with slight curves on the edges. The render was confirmed by Sammobile to be authentic. The render shows the usual Samsung design features including the physical button. Samsung had said previously that it would be redesigning its product line to keep with the times. But if this render is what they have in store for us then it isn’t exactly a departure from the design philosophy that it has gone with in past five years.